WASHINGTON — Solitary confinement “is inhumane and by its design it is driving men insane,” a former inmate who spent 18 years in prison in Texas, a decade of that time in isolation on death row before being exonerated, told a Senate panel in a hearing on Tuesday. The hearing, held before the Subcommittee on the Constitution, Civil Rights and Human Rights, represents the first time lawmakers on Capitol Hill have taken up the issue of solitary confinement, a form of imprisonment that many human rights advocates believe violates the Eighth Amendment’s prohibition of “cruel and unusual punishment” and that has drawn increasing scrutiny in recent months in the United States and internationally. The practice, which is widespread in American prisons, has also been the target of a growing number of lawsuits, including a class-action suit filed on Monday on behalf of mentally ill inmates held in solitary at ADX, the federal super-maximum-security prison in Florence, Colo.
Last month, civil rights lawyers representing prisoners held for more than 10 years in isolation at Pelican Bay State Prison in California filed suit in federal court, arguing that solitary confinement is unconstitutional. Senator Richard J. Durbin of Illinois, the assistant majority leader, began the hearing — which he said had the support of both Democratic and Republican committee members — by noting that more prisoners are held in isolation in the United States than in any other democracy and that about half of all prison suicides occur among inmates in solitary confinement. “We can have a just society, and we can be humane in the process,” Mr. Durbin said. “We can punish wrongdoers, and they should be punished under our system of justice, but we don’t have to cross that line.” He said he was working on legislation to encourage changes in the way solitary confinement is used. Over the course of two hours, the senators heard testimony about the effects of solitary confinement and the steps taken in Mississippi and several other states to reduce the number of prisoners kept in isolation. 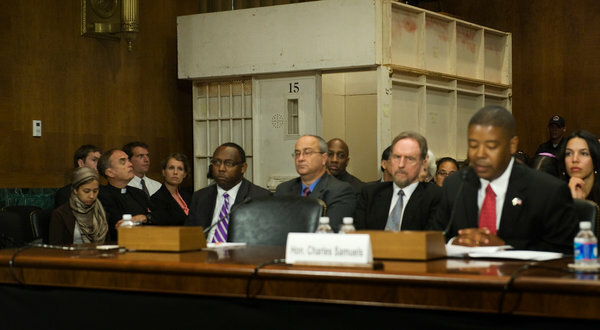 But the hearing also included a testy exchange between Mr. Durbin and Charles E. Samuels Jr., director of the Federal Bureau of Prisons, who defended the use of solitary confinement for inmates who pose a threat to the safety of staff members or other inmates. “Do you believe you could live in a box like that 23 hours a day, a person who goes in normal, and it wouldn’t have any negative impact on you?” Mr. Durbin asked, pointing to a life-size replica of a solitary confinement cell that had been set up in the hearing room. “Our objective is always to have the individual to freely be in the general population,” Mr. Samuels responded. Mr. Samuels said that of the 218,000 prisoners the bureau is responsible for, only 7 percent are kept in isolation cells. The ADX supermax — where many inmates spend 22 to 24 hours a day in their cells and are denied visitors and other privileges — houses only 490 prisoners, or 0.2 percent of the total population, he said.